Carlyle Dental offers ZOOM® Teeth Whitening for residents living in Kinston, Goldsboro, Greenville and surrounding areas of North Carolina. What is ZOOM® Teeth Whitening? ZOOM® Whitening, or ZOOM bleaching, is a professional teeth-whitening procedure using LED-whitening technology. Over time, your teeth can easily become stained and discolored from a wide variety of sources. These variables can be certain medications, colored foods, or drinks such as coffee and wine. Smoking can also change the appearance of your teeth to a yellow or grayish shade. If you’re dissatisfied with the color of your teeth and want a quick solution, ZOOM® Whitening is one of the fastest teeth whitening systems available. It is a safe and effective cosmetic procedure that will quickly brighten your smile. Find out if ZOOM® Whitening is the Best Method of Teeth Whitening for You! 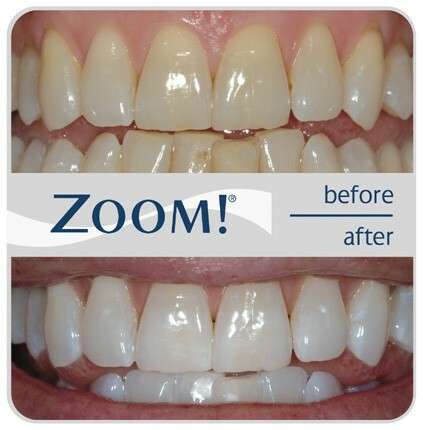 ZOOM® Whitening is a very fast treatment that dramatically whitens your teeth. If you want a clean, vibrant smile, but don’t want to spend time and energy with traditional whitening methods, contact Carlyle Dental. We’re located in Kinston, NC. Learn why ZOOM® Whitening is the best method of teeth whitening, and how it can quickly give you a lovelier, whiter and brighter smile. How Does ZOOM® Whitening Work? There are many reasons for tooth discoloration. Along with many factors that influence a person’s choice of whitening techniques. For best results, it is important to enlist the help of dental professionals such as those at Carlyle Dental. Our warm staff is available for consultation to find which method is best suited for you. ZOOM® Whitening does not penetrate through plaque build-up. For best results, it is recommended that you undergo a teeth cleaning before the procedure. Dr. Carlyle will examine your teeth and gums to ensure that they are healthy. Once approved, the dentist will apply a whitening gel containing hydrogen peroxide on your teeth. The ZOOM® ultraviolet light is placed on your teeth, which activates and breaks down the hydrogen peroxide. This part of the procedure allows oxygen to enter the tooth and bleach the enamel and dentin, giving you a more radiant appearance. For optimum results, three 15-minute applications of gel and light treatments will need to be completed. These will then be followed by a fluoride treatment. Within one hour, your teeth will look up to eight shades lighter giving you a healthier look. Although the procedure itself is painless, some people experience sensitivity afterward, which can be managed with Vitamin E gel and Fluoride. ZOOM® whitening can also be professionally prescribed for use at home, as either a maintenance or post-office whitening treatment. Multiple use will help you maintain the acquired results. Dr. Carlyle will consult you on what will help you achieve the look you want. When whitening your teeth, it is important to keep in mind that ZOOM® Whitening is not a permanent solution. If you smoke, drink coffee, wine, or consume teeth-staining foods, repeat treatments may be necessary. Treatments can last up to six months with proper care. How much does ZOOM® Whitening Cost at Carlyle Dental? ZOOM® Whitening’s cost varies depending on the extent of treatment necessary. We accept cash, MasterCard, Visa, and personal checks. Insurance is accepted, and we also offer financing through CareCredit® and Compassionate Healthcare Services®. Why Choose Carlyle Dental for ZOOM® Whitening In North Carolina?